Ava is an absolutely gorgeous little Lolly jar. Perfect for a dessert table or lolly buffet which requires a smaller glass jar. It's a beautiful curvaceous shape and would look lovely anywhere. 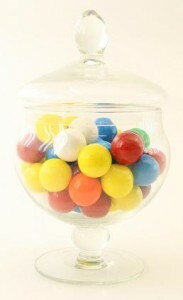 Holds 0.5 of litre of water - this is the best way of measuring how many sweets you will need to fill the jar.